The world has embraced the idea of gestures on a touchscreen as an alternative way of controlling devices, instead of tapping or using a stylus, or using a keyboard and mouse. While this may be useful at present, future ways of interacting with computers could move away from a standard interface and into new directions, such as one that requires input from touch but without using a tactile display. An Apple patent published by the U.S. Patent and Trademark Office on Tuesday for "Fabric-based devices with force sensing" describes how a glove or another wearable item could include force sensing circuitry in its design. By ding so, this could allow for a worn glove to trigger a command to a computer system simply by the user touching a surface or holding an object. According to the concept, the item would consist of fabric containing a force sensor connected to control circuitry, which in turn is connected to signal paths created by conductive strands woven into fabric. The force sensor itself consists of a force sensor element and capacitive force sensor circuitry, with the former including a compressible substrate and multiple electrodes, used to determine the level of pressure in the touch. While the idea could be applied to garments or to new devices that use fabric, Apple does specify a version using a force-sensing glove, which is a natural direction for such a concept considering the hands are the main method of how humans interact with technology. It is also suggested it could be included in embedded systems, such as those in a kiosk, automobile, wrist and head-bands, covers, cases, soft furnishings, and other clothing items. 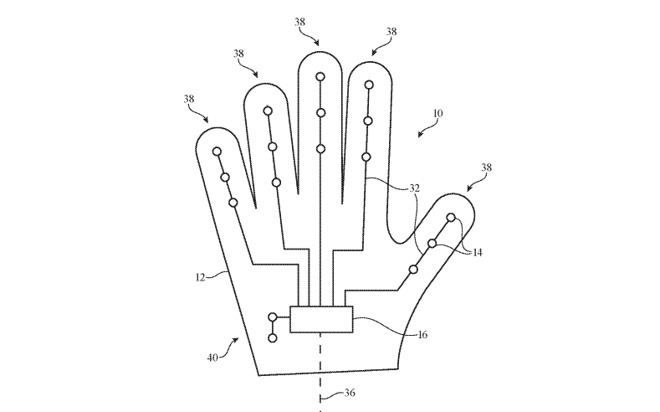 For gloves, Apple suggests the use of strip-shaped polymer substrates, with force sensor elements extended in a row, wording that suggests that multiple force measurements may be taken on a per-finger basis. 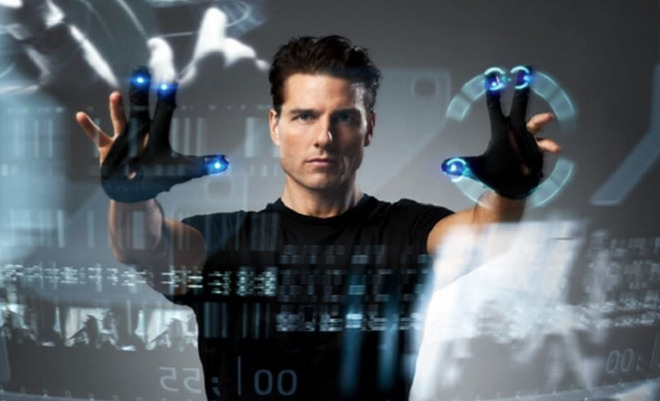 There could also be stiffeners added to each of the force touch elements, which may allow for some level of force-touch measurements to be made without the glove coming into contact with a physical object, feasibly making it useful for touching nonexistent objects in virtual or augmented reality systems. The patent also goes at length to advise the system would use circuits embedded into the fabric itself, such as by using conductive threads or fibers in the weaving process that can come into contact with the sensors. This idea recently surfaced in another patent application for "fabric with embedded electrical components," which used conductive threads woven surrounded by insulated threads to produce fabric with a built-in and functional circuit. While Apple does file for patents on a regular basis, the publication of the concepts are not a sign that the idea will be making its way into a future Apple product or service at all. They do, however, advise of areas of interest to the company, with multiple patents in a field suggesting Apple has spent considerable resources in the area. Interactive flexible and fabric-based items have cropped up a few times in Apple's patent history, and with a few varied uses. Like the recent fabric patent application, the new patent could potentially be used as part of a health-monitoring system that uses clothes instead of obtrusive devices like the Apple Watch. It is also entirely plausible force-sensing fabrics and clothes could be used alongside flexible displays to create smart clothing, with the force sensing elements being used as an input method. Apple has looked into devices with fabric-like elements, as well as exploring flexible OLEDs and investments in MicroLED technology that could be used in these ways. 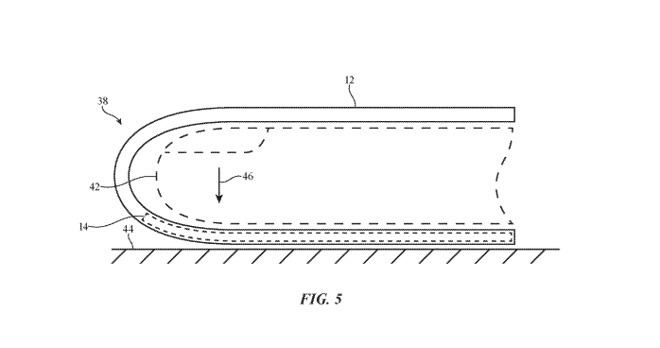 A connected patent from July involved stretchy and deformable elastomeric substrates as a form of circuit board. It would be logical that a system using fabric-based circuits may also require other non-fabric elements to behave like a circuit while still remaining malleable. Apple has also looked into ways to expand the Apple Watch's utility by altering the bands, such as making them light up, adding a camera, and other indicators. Force-sensing fabric could potentially be used in a smart band to trigger actions in the Apple Watch, without necessarily needing to navigate through the usual interface.